Muled type imitations of AD 330-340.
are official types. When the reverses are unintentionally interchanged, the coins are "mules." The vast majority of imitations from this time period combine the obverses and reverses properly, but occasionally a mule is found. Scholarly opinion is that these mules were not intentionally officially issued, and certainly the numbers of mules that are obvious imitations far exceeds the numbers of mules that have any claim to possibly being official. One of the best such mules is next. Good style and lettering, but an expert on the issue assures me this is not the official style of Lugdunum, in spite of the PLG mintmark of Lugdunum (see RIC page 140), so it is an imitation. 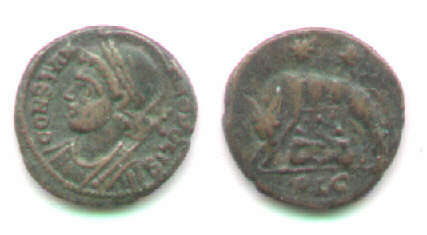 This coin was published in SAN XI.2 (1980) page 37 as potentially official. Subsequently Pierre Bastien saw it and told me he thought it was an imitation. Then this piece was cited in A Survey of Numismatic Research, 1978-1984, page 288. The existence of offical mules of this period was the subject of several articles in SAN (VI,1 (1974), pages 8 and 15; VI.3 (1975) page 42; X.2 (1979) pages 20-21; X.4 (9179) page 60). After 20 years studying the matter, I think no mules of these types were intentionally issued, but I do not rule out a simple mint error in some cases. Another mule of excellent style, but lesser preservation. If official issues of this type, size, and mint existed, this would be regarded as one. CON..../wolf and twins, no mintmark. 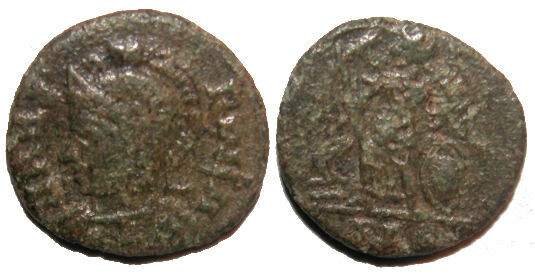 The busts of Roma and Constantinople are similar, but the sceptre over the shoulder characterizes Constantinople. It serves to distinguish the types when the legend is unclear. Weak strike. Mintmark, if any, off the flan. 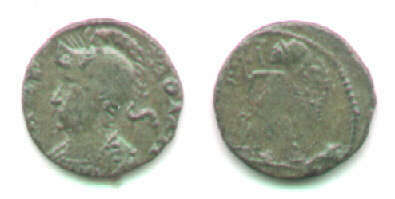 Beautiful and good style Victory reverse, but a crude VRBS ROMA obverse. 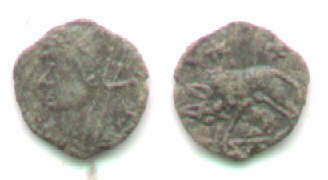 Bust right (usually it is left) in helmet with ROMA retrograde and the rest blundered or doublestruck enough to be illegible. 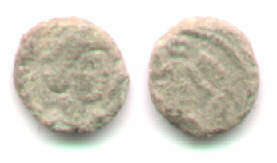 It must be a contemporary imitation mixing the usual CONSTANTINOPOLIS reverse with the usual VRBS ROMA obverse retrograde. A "hybrid" or "mule" (the reverse does not belong paired with the obverse) for types but its greatest interest is the style. The reverse Victory looks official and very well-done. The obverse is the wrong type, retrograde, and cartoonish. Remarkably inconsistent! Mintmark, if any, off the flan. 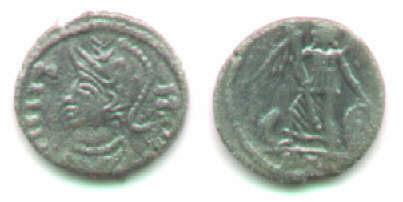 The head would be of Constatine or, more probably, one of his sons Constantine II, Constans, or Constantius II. "AMOR" legend with "ROMA" retrograde. The entire head side is reversed. 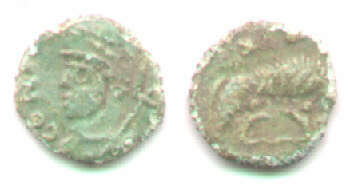 No visible mintmark. 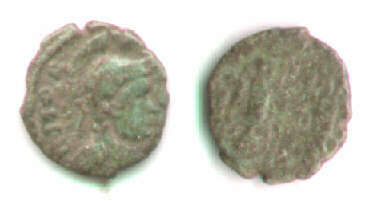 Imitators had no need, once the coins were so obviously irregular, to pair the correct obverse and reverse types. Tiny! Looks like Helena (or possibly Theodora), but definitely a female. /Victory left, as on the CONSTANTINOPOLIS pieces. This is a major mismatch of types. It was found in the English midlands in 1996 and has the typical English green patina/corrosion. You have just finished page 4 of this subgroup. Continue with the page on imitations from AD 340-348. Return to the page on GLORIA EXERCITVS imitations and official types of 330-340 (page 1 of this subgroup). Return to the page on VRBS ROMA imitations (page 2 of this subgroup). Return to the page on CONSTANTINOPLIS imitations (page 3 of this subgroup).